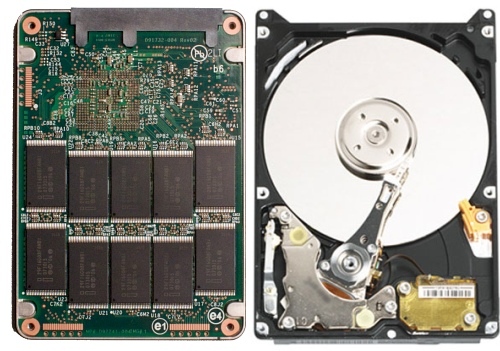 If you want to make your computer run faster and more efficiently, one upgrade option you should not over look is the latest technology within data storage – Solid Sate Hard Drives (SSD) It is one of the most popular computer upgrades in Sutton Coldfield that we are asked about. Traditional hard disk drives have worked on what is essential gramophone technology since modern computers fist appeared. Disks which contain your information spin round at high speeds while being read by a sensor attached to an arm which travels over the surface of the disk looking for the information required. This obviously uses power to spin the disks and move the arm and this is one of the noises you may be able to hear coming from your computer. Changing your traditional hard drive for a modern SSD can totally transform your user experience in ways you might expect and ways you might not. If your SSD equipped computer can start up in less than 10 seconds, from power on to useable desktop with a browser open, then you can practically abandon functions like sleep mode. Sleep mode puts your computer into a low power state to enable you to get back to your work quickly when returning to the computer, if your computer can start from scratch in the same time as a traditional computer takes to wake from sleep then you can disable sleep mode entirely which will save power and money in the long term. Installing an SSD in your laptop can improve battery life, prevent it getting so hot, and protect your data should the laptop be dropped – these are all advantages of using a method of data storage which uses no moving parts at all. Have a look at the following video showing the benefits of SSD’s. How hard is it to upgrade to an SSD? Currently SSD hard drive prices (per gigabyte) are considerably higher than traditional hard disks, the total capacities are also lower (average 120 / 256GB SSD’s vs 1000+GB for traditional drives) so depending on your usage and requirements you may need to have more than one drive installed but we can advise you on the best setup for your situation.